« What are the best places in the world to see snakes? 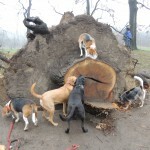 Milligan is a beagle triathelete: he jumped right on this stump to get peanut butter, he sings and he charms his way into many treats. 1. Assemble your pack of beagles. If you don’t have a pack, a brace will do in a pinch. Or go to Meetup.com and call a pack together. 2. Find a complicated and cragily tree trunk. You want the kind of roots that like to reach up and trip passerby. A downed tree is a plus. 3. Smear peanut butter. Other nut butters, liverwurst or cream cheese is also acceptable. A generous host might also insert liver or other high value treats in holes and cracks. 4. Let the beagles have at it. They will climb, jump and scamper higher than you’ve seen. 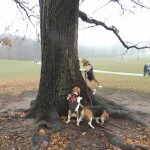 Last weekend we had a meetup of about 20 beagles in Prospect Park at the same time as FIDO’s holiday party. Moxie and Huck, familiar with the game, had a kind of home field advantage at first. But the other hounds caught on quick. 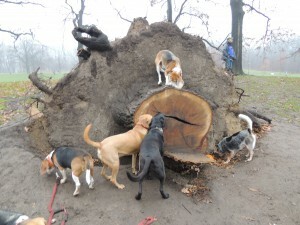 Milligan, a charming one-eyed senior with an incredible voice, jumped right on the giant oak trunk. 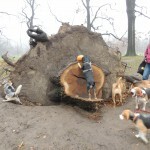 Other beagles climbed the roots, dug into the pit or excavated a crack. For days afterward the beagle were checking the spot for more peanut butter to appear.